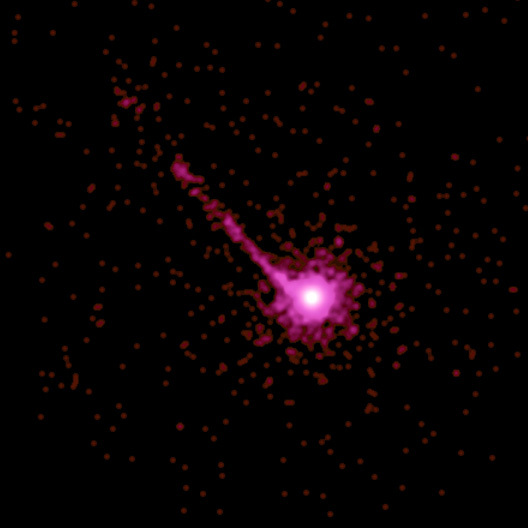 The X-ray image of the quasar PKS 1127-145, a highly luminous source of X-rays and visible light about 10 billion light years from Earth, shows an enormous X-ray jet that extends at least a million light years from the quasar. The jet is likely due to the collision of a beam of high-energy electrons with microwave photons. The high-energy beam is thought to have been produced by explosive activity related to gas swirling around a supermassive black hole. The length of the jet and the observed bright knots of X-ray emission suggest that the explosive activity is long-lived but intermittent. 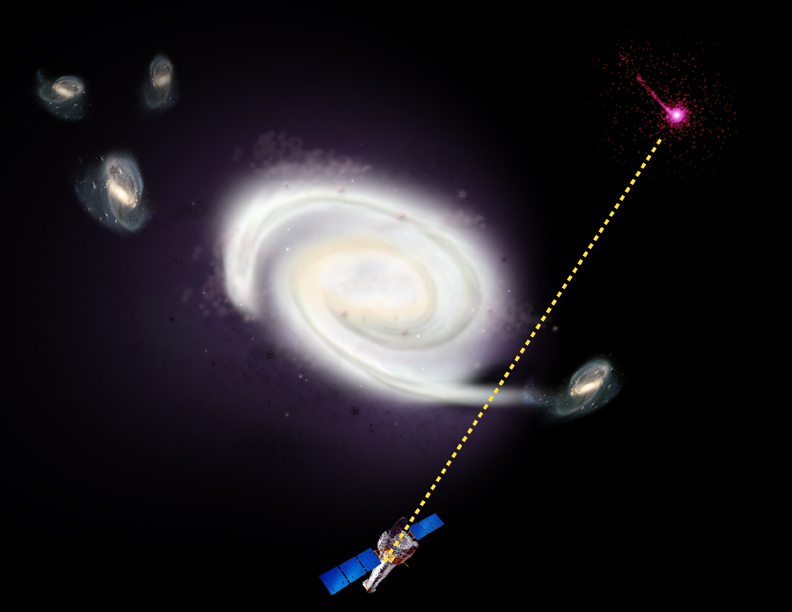 On their way to Earth, the X-rays from the quasar pass through a galaxy located 4 billion light years away. Atoms of various elements in this galaxy absorb some of the X-rays, and produce a dimming of the quasar's X-rays, or an X-ray shadow. In a similar way, when our body is X-rayed, our bones produce an X-ray shadow. By measuring the amount of absorption astronomers were able to estimate that 4 billion years ago, the gas in the absorbing galaxy contained a much lower concentration of oxygen relative to hydrogen gas than does our galaxy - about 5 times lower. These observations will give astronomers insight into how the oxygen supply of galaxies is built up over the eons. Scale Image is 60 arcsec on a side. Coordinates (J2000) RA 11h 30m 7.10s | Dec -14° 49' 27"